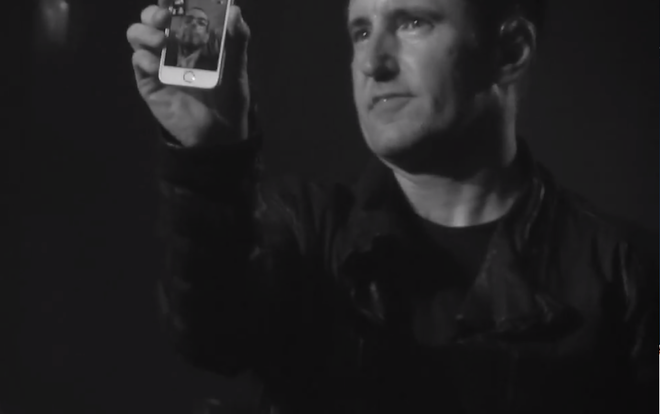 During a show in Las Vegas last weekend, Nine Inch Nails frontman Trent Reznor paid tribute to a friend battling terminal cancer by pulling out his iPhone 5s to initiate a FaceTime call with him on stage during his show. Reznor's FaceTime call brought photojournalist Andrew Youssef virtually on stage in front of an audience cheering his name. Youssef has spent years capturing the live music scene as a concert photographer, documenting acts from Black Sabbath to the Cold War Kids. According to a report by music site Consequence of Sound, Youssef was diagnosed with advanced colon cancer in 2011, and has spent his time since documenting his efforts to continue his photography while battling the disease in "Last Shot," a regular column for OC Weekly. His last column appeared October 3, where he described an assignment photographing Depeche Mode, writing, "my strength is definitely not where it should be but with the help of my brother who drove and helped carried my camera bag, I successfully accomplished my mission." In covering NIN's performance at San Francisco's Outside Lands Festival this summer, Youssef described his emotional connection with the band's music and lyrics entwined in his own battle with cancer. Reznor began following Youssef on Twitter shortly afterward, and then invited him to a performance at the more intimate Troubadour in West Hollywood, where the two became fast friends. As Youssef's condition deteriorated, his doctor advised against also attending the November 16th show at the Hard Rock Hotel as he had planned. That prompted Reznor to connected with Youssef via FaceTime as the crowd cheered, sharing the event and dedicating the song "In This Twilight" to Youssef. Apple's Steve Jobs first announced FaceTime in 2010 as a feature of the then new iPhone 4, and subsequently made the video conferencing system available to the iPod touch and to Mac users by the end of that year. Last year, iOS 6 enabled FaceTime over mobile networks rather than being WiFi only, and the latest iOS 7 enables audio-only calls. Apple has presented FaceTime in a series of emotionally touching ads that focus on the value of face-to-face communication, including this summer's spot ending with the line, "everyday, more people connect face-to-face on the iPhone than any other phone."